В воскресение вечером состоялось вручение наград ,которое вела Майли Сайрус. Совсем недавно,на сайте MTV была опубликована статья с таким заголовком ''Иллюминаты контролируют шоу-бизнес? Да'' ,где в общем ,была рассказана чистая правда,но в шутливом тоне,призывающим читателей посмеяться над написанным. 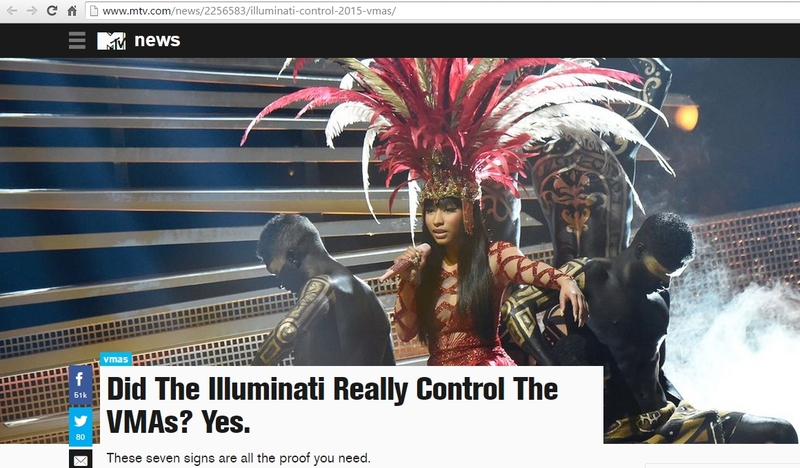 Did The Illuminati Really Control The VMAs? Yes. These seven signs are all the proof you need. Remember how we debated and then ultimately proved that the Illuminati were definitely pulling the strings at last year’s Video Music Awards? Well, make no mistake: the ‘nati were back and weirder than ever at the Miley Cyrus-hosted bash Sunday night. For those who need a little history lesson, let’s go over it real quick: the Illuminati are legit, y’all. Established in 1776 (according to Wikipedia), they’re basically a not-so-secret society comprised of influential people whose objective is to create a New World Order that’s conspiring to rule the world through a totalitarian one-world government. In simple terms? They’re elitists who wanna run s—t. Now, the thing about the ‘nati is that even though they’re (sort of) a secret society, their satanic agenda is actually pretty visible, thanks to a bunch of occult symbolism and subliminal messages that are used in music and movies to control the masses. Soooo, yeah, the much-hyped and widely-watched VMAs are basically the perfect place for them to brainwash us all. THIS DUDE RIGHT HERE lit the dang stage on fire. Engulfing something in flames… how much more ’nati-like can you get?! To top it off, the lyrics to “Can’t Feel My Face” are filled with themes relating to immortality, like “But at least we’ll both be beautiful and stay forever young, this I know.” You could easily decipher that as an almost-threatening statement of power. Nicki Minaj was the female overlord. Sure, you could argue that hostess Miley or Video of the Year recipient Taylor Swift had the biggest night of any woman at the VMAs. But Nicki’s opening performance basically kicked off the show as a mission statement of sorts. Dressed in head-to-toe red (a favorite ’nati color) and accompanied by a squad of manservants/disciples at her side, her performance was tribal and gritty and amazing. And, you guessed it, totally Illuminati-like. Plus, the fact that Taylor joined her onstage was probably a gesture to let the world know that with the two biggest female artists back on good terms, the society is now unstoppable. Trios were formed before our very own eyes. We’ve said it before, and we’ll say it again: this society LOVES their dang triangles. It has a ~spiritual~ significance to them, so we think it’s no coincidence that one of the most anticipated performances of the night was when Twenty One Pilots teamed up with A$AP Rocky. It’s a trio that no one was expecting, and that somehow magically worked. Know why? Because the Illuminati make s–t HAPPEN in threes. The stage resembled a pyramid of sorts. Remember how last year’s VMA stage was spiral-shaped, calling to mind the society’s penchant for hypnosis and mind control? Well, this year’s stage was maybe a little more subdued, but still inarguably Illuminati-like because of its resemblance to a pyramid, a.k.a. a major symbol for the society. Here’s a shocker: Demi Lovato’s ’Cool for the Summer’ may be a lot darker than you realize. We already noted The Weeknd’s mysterious lyrics, but there are a few more worth noting from tonight’s performers. For instance, when Demi Lovato gave a sizzling rendition of “Cool for the Summer,” we bet you couldn’t help but notice how she maintained piercing eye contact while singing the line, “die for each other.” Hmm… hinting at human sacrifice perhaps? OK, yes, that turned very dark very fast for a performance that included a kiddie pool, but just roll with us here. It’s also worth pointing out that Demi’s BFF Nick Jonas sang a song called “Levels.” The Illuminati are way into structure and hierarchy, so we’re thinking “levels” definitely has a subliminal meaning. We’re on to you, Jo Bro! Finally, Kanye West revealed the Illuminati’s agenda. If Kanye is part of the Illuminati (which, OK, he’s denied before, but C’MON! He’s Kanye Freakin’ West), then he basically slipped up and told everyone that the society will execute their takeover in 2020, when he runs for president. Which, according to these confident people, will be a highly successful bid. 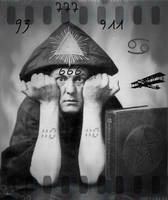 Prepare yourselves, everyone… only five more years until the Illuminati take over the world!